I first came across Dalefoot Compost at RHS Chelsea in 2015 and felt rather ashamed that despite living in the Lake District I had very little knowledge of the company or their products. When I got talking to them on their Chelsea stand I discovered that there was something quite different with this compost and when I was told that it was peat free and made from sheep’s wool and bracken, my interest was piqued. 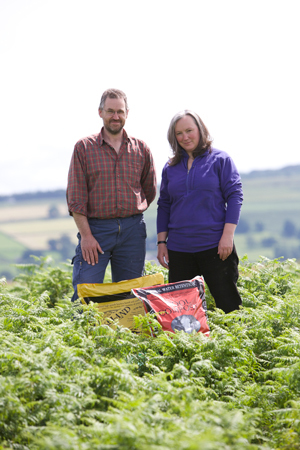 Dalefoot is the brainchild of Lake District farmer Simon Bland and environmental scientist Jane Barker, (pictured left) who use wool from their own flock and the Herdwick ‘wool-clip’ of neighbouring hill farmers, including National Trust tenants. 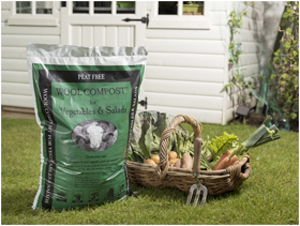 Producing the compost is a win-win situation because not only is Dalefoot helping the growing number of gardeners who want to switch to peat free, the compost also finds a novel use for British wool – good news for struggling sheep farmers. The use of bracken in the Wool Compost is also beneficial because the spread of this aggressive, waist-high plant in the Lake District makes grazing difficult and impacts upon native species. I have to admit that I have not always been satisfied with peat-free composts although I know that it makes sense to switch, so I was keen to try Dalefoot for myself and see how it performed. I couldn’t get my head around how a compost with sheeps’ wool in it was going to perform in my wet Cumbrian garden. I was also unsure if the compost would be suitable for flowers as I do not grow vegetables. So the first test was the dahlia bed, where I liberally spread the compost and sat back and waited. The feel of the compost felt strange to me and I was very unsure how all this was going to work – sheeps’ wool and bracken seemed to me to be a rather strange combination to put on my flower beds! To say the dahlias’ that year looked as though they were on steroids would be an understatement but perform they did. I am also a reckless gardener and somewhat lazy so I leave my tubers in the ground over winter and just hope they appear again in the spring. What I hadn’t counted on was the very, very wet winter of 2015, floods and all. How would the dahlia area cope with the extreme weather conditions? Come the spring, I was quite certain that my lovely dahlias would have bitten the dust, so I was more than overjoyed when little green shoots started appearing. In a dry weather situation, the natural water retention of wool fibres also means that you need 50% less watering while the high levels of natural potash from the bracken promotes flowering and fruiting as well as healthy growth. Wool is also a slow sustained supply of nitrogen and as Dalefoot point out, there is no need for any additional plant food. I did not feed my dahlia bed at all during the season so another bonus. Since then I have used Dalefoot compost in a number of situations including pots and hanging baskets. Dalefoot are refining their compost mix all the time and now have a number of varieties suitable for a range of growing uses. What I like about using Dalefoot is that the compost is made from totally renewable resources which obviously has environmental benefits. The ideas for the range of composts comes from old gardening books and are all made on a small Lakeland hill farm, near Penrith, Cumbria. Traditionally, bracken has been used as an animal winter bedding material in the Lakes, which was then spread on the land in spring to fertilise the fields. The rich source of humus with a wide range of trace elements, ensured the meadows and pastures got off to a good growing season. That age-old recipe has been developed into the range of Dalefoot Composts. 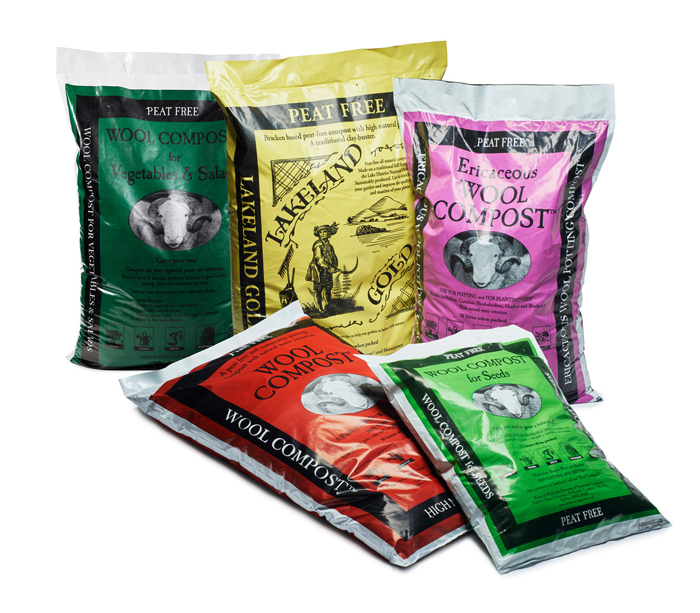 The range includes Wool Compost Ericaceous (for acid-loving plants), Lakeland Gold (claybuster and mulch), Wool Compost for potting and containers and now there is also Wool Compost for Seeds. As well as farming and manufacturing compost, Dalefoot are one of the leading contractors involved peatland restoration works.